Fine condition hardback book. Clean, bright and tight in a Fine condition dustjacket. This book is a fascinating historical memoir which gives much insight into the collapse of Hitler’s Germany. 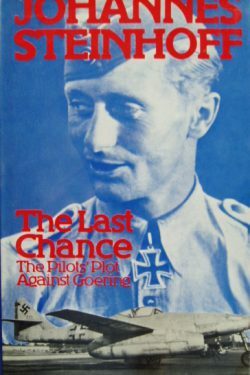 In the final stages of WWII, Steinhoff and five fellow officers tried to oust Goering and his high command from the leadership of the disillusioned Luftwaffe. The author’s description of a crumbling Germany in which its exhausted leaders try to pass the blame for inevitable defeat is portrayed with clear observation and great depth of feeling. His descriptions of air combat are realistic and detailed. 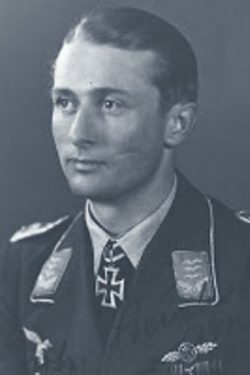 ‘Macky’ Steinhoff was one of very few Luftwaffe pilots who survived to fly operationally during most of WWII, crashing on take off in an Me262 in April 1945 and suffering horrific burns which kept him in hospital for 2 years. 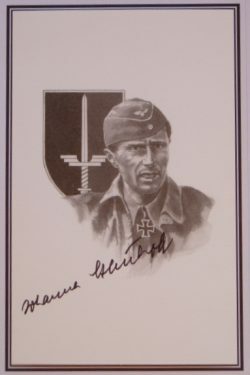 He was an ace with 176 victories and post-war played a significant role in rebuilding the German Air Force and then serving as Chairman of NATO’s Military Committee from 1971-74. This is a very collectable book and signature and is a fascinating read too.